Brakes are the number one thing no car can be without. No matter how well an engine performs, if you can’t stop the vehicle, it is no good. Every car has two brakes in the front and rear. Older models have drum brakes. Cars made after 1970 have disc brakes. Some have disc brakes on the front and rear. Others have disc brakes up front and drum brakes on the rear wheels. Both types use a combination of the hydraulic brake system and brake pads or shoes. The friction they create causes the vehicle to stop when pressure is applied to the brake pedal. All brakes need attention from time to time. The major components of the brake system consist of the brake calliper, brake pads, and brake rotors. 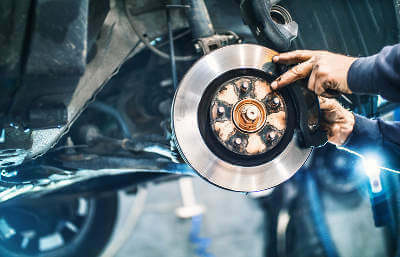 Taking care of your brake system includes replacing brake pads when needed, inspecting brake rotors, and keeping the master cylinder filled with the correct level of fluid for the brakes. Most vehicles have a reservoir that allows checking brake fluid without having to open the cap. The markings on the side reveal whether brake fluid needs to be added. It may be necessary to clean road grime from the area in order to clearly see the marks. If adding fluid is necessary, follow these guidelines. Thoroughly wipe down the area with a rag. Foreign materials that get into the sensitive braking system can degrade and clog its components. Cleaning avoids potential problems. Do not shake the brake fluid bottle. The bubbles can cause harm to the system. Add the fluid slowly, and then check again in a few days. The hydraulic clamp pinching the brake pad to the rotor is the calliper. Signs of wear include brake lock-up, pulling to one side when applying the brakes, reduced braking force, and a spongy feel to the brake pedal. Fluid leaking near the calliper, and longer stopping distances are also warning signs. Rotating discs that help vehicles slow down or stop when brake pad contact is made are the rotors. Visually inspect brake rotors. If they have groove cuts or scores, they need to be replaced or resurfaced. The indentations are caused by worn brake pads that have placed the metal to metal when making contact. You may also see purple or blue spots on the rotors that indicate a necessary change. Besides worn or heat-cracked rotors, check for loose-fitting or worn brake pads in the calliper. An uneven torque of calliper hardware or lug nuts is also a sign that brakes need to be repaired or replaced.